The Screech Owl beaded amulet pouch necklace is made entirely of highest quality glass seed beads in shades of black, gray, white, brown and green and features a strong snap closure. 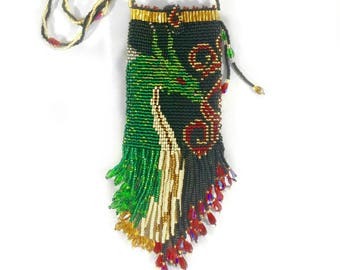 The bag is 1.5 inches wide, 2 inches long. 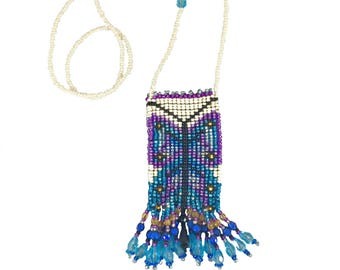 The entire necklace is 18.5 inches long from the halfway point of the beaded strap to the bottom of the bag. You will be noticed when you wear this piece. 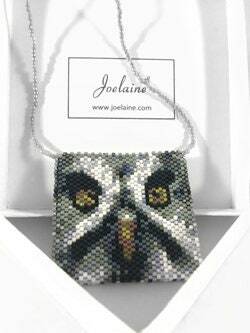 It is the perfect carrier for a crystal or special stone or aromatherapy diffuser or solid perfume.